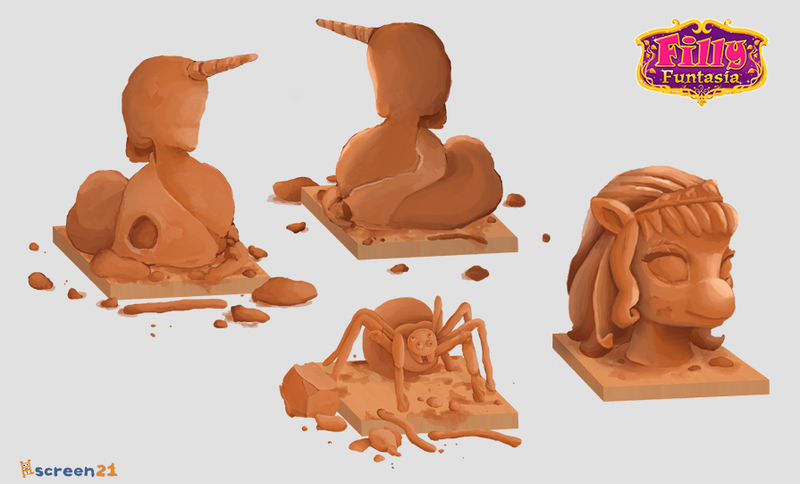 The first piece of concept art shows a collection of clay statues: an unfinished unicorn, a spider, and a Filly head. The head does not seem to belong to any of the shown Fillys. Each statue has the same square stand underneath. These statues are most likely products of students' activity, probably for a sculpting competition. 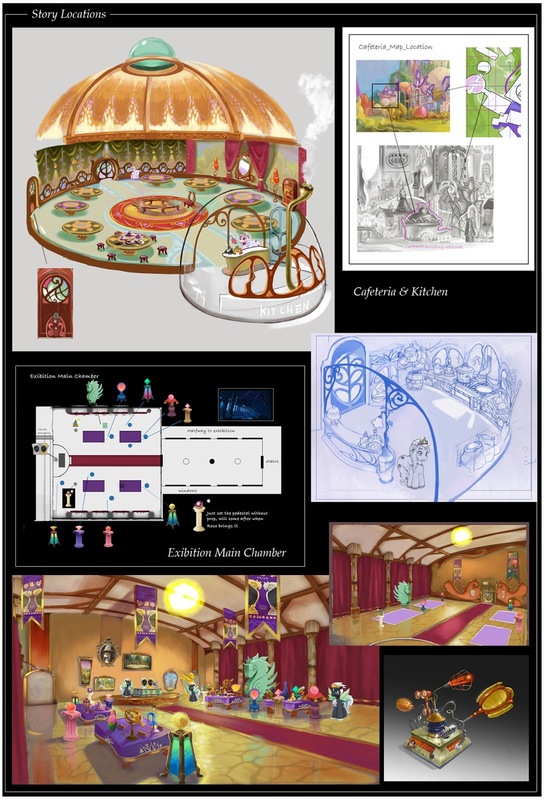 I would not be surprised to see these statues being shown off in the exhibition main chamber, from another collection of concept art. 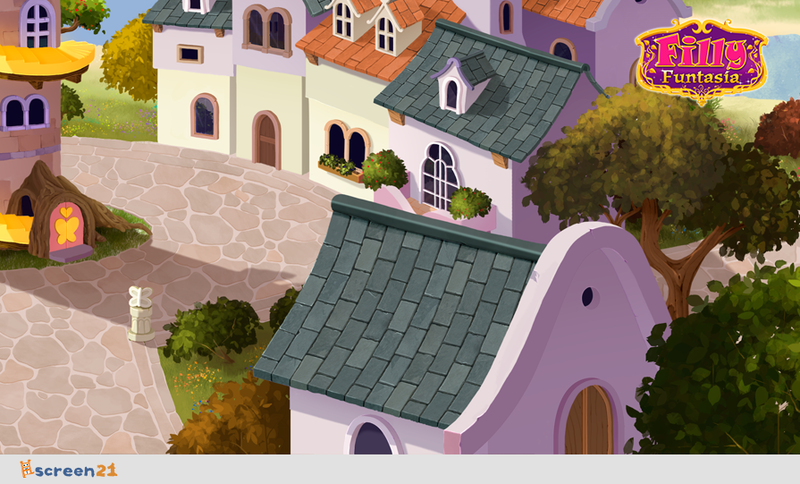 Moving on to the next image, a tower in the middle of a town square. The tower bears resemblance to the Flower Tower of Papillia. Just about every element of the tower is preserved. 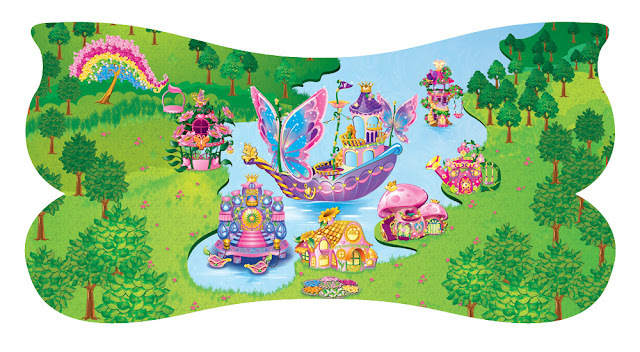 The only two major differences are that the swings that used to hang from the tree to the right are missing, and the concept art tower is modified to look more like a proper building, rather than a toy. The biggest difference has to do not with the tower itself, but with its location. According to the comic books, the Flower Tower is located off the shores of Papillia, in the middle of the sea. 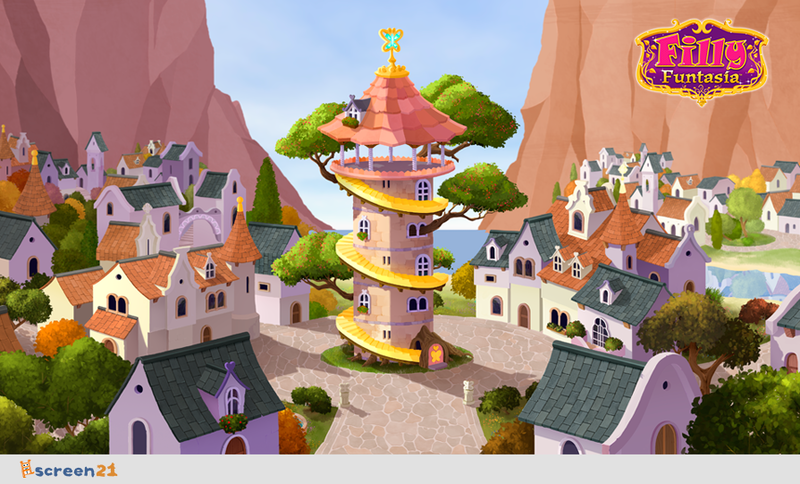 The concept art tower, however, is located in a town - a town that does not look like a part of Papillia at all. My guess is that this is a deliberate change to the setting of Papillia. The two cliffs to the left and right on the concept art seem to be awfully close to the town. Toy-wise, the geography of Papillia lacks such cliffs at all. The concept art of the tower can easily fit into the crevice to the left. The concept art of the tower also indicates water in the background, which fits in with the waterfalls that flow out of the crevice. Finally, the third piece of concept art. This is a zoomed part of the previous image, giving us a better look at the architecture around the tower. And that is all for today. Thank you for reading, and have a nice day.